Our new Cross Country Rider by Michael Lovejoy has been sculpted in a classic pose with plenty of detail such as safety hat, body protector and gloves. He measures 2.1 inches (5.3 cm) tall or 1.2 inches (3.25 cm) from top of hat to buttocks and 0.83 inches (2.1 cm) from buttocks to heel. The Cross Country Rider is cast in polyurethane resin which will enable you to fit it accurately to your model and tack for a more realistic look. This can be achieved by warming the resin while fitting it to you model prior to painting. 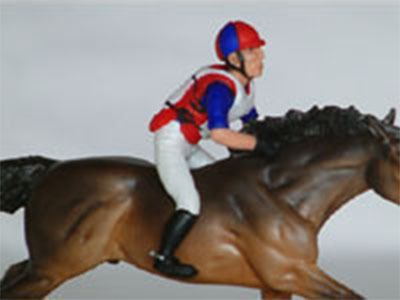 This Cross Country Rider is part of a range of Stablemate riders we are produce especially for the larger Stablemate horses in the hobby. These will be ideal for Sarah Rose, D'Arry Jone Frank, Animal Artisty resins.